Pitchers and catchers have reported to Tampa and the long journey that is the 2019 Yankees season is underway. Position players will report Monday and the first Grapefruit League game will be played one week from Saturday. Soon the beautiful monotony of Spring Training baseball will set in and we’ll all eagerly await the regular season. I love this time of year. The Yankees, despite not signing Manny Machado or Bryce Harper, had one of the most active offseasons in baseball, one that saw them sign five notable free agents and make one significant trade. Believe me, the Harper and Machado thing irritates me as much as anyone, but you can count on one hand the number of the teams who have done as much as the Yankees this winter. Have the Yankees done enough to close the gap on the Red Sox? I think so. You’re welcome to feel differently. The Yankees won 100 games last season and that’s an awful lot. 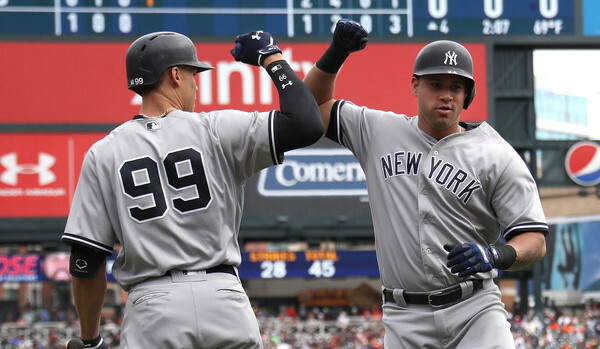 It’s not often teams win 100 games in back-to-back seasons (only the 2017-18 Astros and 2004-05 Cardinals have done it within the last 15 years), but, with a talented roster, the Yankees have a chance to do it. Would be cool. Now that Spring Training has opened, this is as good a time as any to take stock of the 2019 Yankees, and discuss why we should expect the 2019 Yankees to be better than the 2018 Yankees. The 2018 Yankees were really good! I see four reasons why the 2019 Yankees could be even better. Here are the four in no particular order. For all intents and purposes, the 2018 Yankees played their final 61 regular season games without Aaron Judge. His wrist was broken by an errant pitch on July 26th, in the 101st game of the year, and he did not return until the team’s 147th game on September 14th. And, when he did return, he stunk. Judge went 9-for-47 (.220) with two doubles and one homer (.341 SLG) in 13 regular season games following the wrist injury. Gary Sanchez was not good overall last season and apparently he wasn’t healthy either. His shoulder bothered him enough that he needed offseason surgery, and of course he spent roughly two months on the disabled list with groin trouble. It would be easy to blame the injuries for Gary’s down season. I’m sure they played some role in his poor year, particularly the shoulder, but there were some other issues at play as well. The Yankees can go into this season reasonably expecting Judge and Sanchez to be healthy. Judge’s injury was a fluke and he showed in the postseason the wrist was strong. Sanchez’s shoulder has been repaired and he is already hitting in the cage and catching bullpens, so he’s on track for the regular season. The Yankees will ease him into Grapefruit League games because there’s no reason to push it. Injuries happen and Judge and Sanchez could miss time again this year. That’s baseball. Neither has a chronic issue that dogs them year after year though — this isn’t Greg Bird with multiple years of ankle problems, you know? — and I think it’s reasonable to assume good health going into 2019. In this case, that means 90 or so more man games from Judge and Sanchez this year than last year. At this time last year we were talking about how having full seasons of Sonny Gray, David Robertson, and Tommy Kahnle would help the 2018 Yankees be better than the 2017 Yankees, so yeah, this game can humble you quick (one outta three ain’t bad, right?). The logic is sound though. They had this good player for half the season last year and now they’ll have him for a full season this year. I do worry a bit about Happ’s declining fastball spin rate because he relies so heavily on his fastball, but he was also rock steady following the trade last year, and he is essentially replacing the revolving door of fifth starters. Domingo German, Luis Cessa, Jordan Montgomery, Jonathan Loaisiga, and Chance Adams combined to allow 116 runs in 30 starts and 136.2 innings last year. They averaged 3.9 runs and 4.6 innings per start for 30 starts. I kid you not. Happ has made at least 25 starts every year since 2014 and he’s posted a (much) better than average park adjusted ERA every year since 2015. 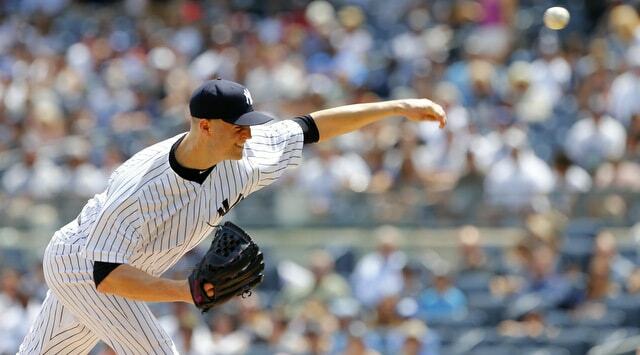 Even at age 36, I feel like Happ is a safe bet to make 25 or so league average starts this year. Given who he’s replacing, that’s a big upgrade. With Gray, we saw some warning signs late in 2017, when he lost the plate and seemed overwhelmed. That wasn’t the case with Happ last year. He came over at the deadline and fit right in. Britton got better and better as he got away from his Achilles surgery last year and now he’ll have a healthy and normal Spring Training after a healthy and normal offseason. “I went home (after the ALDS), took a day off and started working out the next day and I started throwing a few weeks earlier than I normally do … I just wanted to get rid of some bad habits I (developed after the injury) last year and get ready to go for wherever I was gonna play,” said Britton to Dan Martin the other day. Full seasons of Gray and Kahnle didn’t help the Yankees last season, but Happ and Britton are more Robertson than Gray and Kahnle given their track records, are they not? Gray had a few moments that made you wonder what was up in 2017. Kahnle never found a set role before his monster postseason. Happ and Britton came over last year and never really missed a beat. They transitioned seamlessly and having them for six months rather than two months is significant. Gray was supposed to be the upside starter. The guy with multiple years of cheap team control who had flashed ace ability in the past. The Yankees hoped to bring it out of him permanently and the opposite happened. He was a disaster last season. James Paxton is cut from a similar cloth in that he’s flashed ace ability over the years and the Yankees are hoping he’ll pitch at the level consistently. Paxton misses more bats than Gray ever did — Paxton had a 32.3% strikeout rate last year whereas Sonny’s full season high is his 22.6% strikeout rate in 2017 — and he’s been better the last two years than Gray was in his two years prior to the trade. As for the “he can’t handle New York thing,” I don’t know what to tell you other than James Paxton is not Sonny Gray. They’re different people. One has no impact on the other. I was a big Sonny Gray fan and I was thrilled when the Yankees made the trade in 2017. I feel better about Paxton now than I did Gray then because his strikeout and contact management tendencies are better. We know that, despite all his natural talent, Sonny was not working out for the Yankees. He was terrible. Paxton is not guaranteed to succeed just because he’s not Gray, but I feel really good about what he’s bringing to the table. The potential upgrade is enormous. Giambi, Sheffield, and Teixeira all hit the ground running in year one. Beltran and A-Rod in particular were quite a bit better in their second season with the Yankees though, and McCann as well. Even Hideki Matsui went from a 109 wRC and +0.2 WAR in year one as a Yankee to a 140 wRC+ and +3.0 WAR in year two. That first season in New York can be a slog. Giancarlo Stanton is now entering year two as a Yankee. All those new team, new teammates, new coaches, new city, new league, new ballpark feelings go away. Maybe they don’t go away, necessarily, but everything is more familiar now. Baseball players are creatures of habit and Stanton went from a largely irrelevant franchise to the center of the baseball universe last year. That had to be a tough adjustment. Now he knows what to expect. I don’t know about you but I am fully expecting Giancarlo to have a big 2019 season. He wasn’t bad last year by any means — most players would kill to have .266/.343/.509 (127 wRC+) with 38 homers and +4.2 WAR be considered a down year — but Giancarlo went into 2018 with a career .268/.360/.554 (144 wRC+) batting line, so we know there’s more in there. Will he ever hit 59 homers again? Probably not. That is a lot of homers. Stanton turned only 29 in November though. He’s right smack in the prime of his career and I expect a big second season in New York. Keep in mind that the Yankees are built around a strong young core, and when you have players this young and this talented, the potential for natural improvement is awfully exciting. Miguel Andujar and Gleyber Torres with a better understanding of how pitchers are attacking them could be even more productive this year. Maybe Luke Voit really can do that across a full season. Luis Severino is still only 24! That second half last season could be a valuable learning experience. To me, the biggest difference between the 2019 Yankees and the 2018 Yankees is replacing Gray and the fifth starter revolving door with Paxton and Happ. Those stand out as two significant upgrades. Healthy Judge and healthy Sanchez will undoubtedly help as well, ditto a full season of Britton, and Stanton without that first year adjustment period. It’s difficult to improve on a 100-win team. With Paxton and Happ, the Yankees have done it, and there are reasons to believe several incumbent players are poised for better seasons as well.